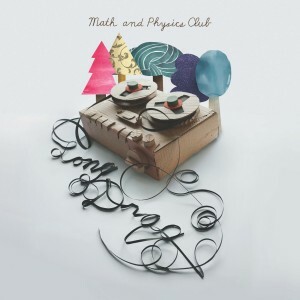 Seattle indie darlings Math and Physics Club come out swinging with their latest single and first release in three years. ‘Long Drag’ is the lead single from the band’s forthcoming ‘Our Hearts Beat Out Loud’ LP, and this time they’re playing against type with a raw, groovy stomp that sets moody lyrics against a sassy, schoolyard beat. The exclusive b-side ‘Across the Paper’ takes a more soft shoe approach, with ukulele, mandolin, and warm harmonies providing the backdrop for broken hearts. Recorded by Bob Schwenkler at Olympia’s fabled Dub Narcotic Studio, the single heralds a definitive return for our favorite American band. Pressed on coke bottle green vinyl and limited to 500 hand-numbered copies in a super hip sleeve designed by artist Tae Won Yu. La prima e quella che sinceramente mi ha esaltato più di tutte, è il ritorno del club di matematica e fisica. Ormai a tre anni da I Shouldn’t Look As Good As I Do con quel piccolo capolavoro di singolo che era Jimmy Has a Polaroid, il terzetto di Seattle se ne torna con un nuovo singolo che anticiperà il nuovo disco (!!!) Our Hearts Beat Out Loud previsto per fine anno. Long Drag (7″ limitato ordinabile qua) gioca sulla ritmica e sugli handclapping per un pezzo è che già diventato un piccolo classico. --Frigopop!